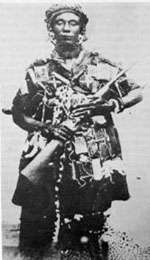 Yaa Asantewaa was an influential Ashanti queen at the beginning of the twentieth century who remains a powerful symbol today. Her birthdate is contested; she is generally believed to be born between the 1840s to 1860s in the Ashanti Confederacy in present-day Ghana. She was a skilled farmer before ascending to the title Queen Mother in the 1880s. It is believed that she was chosen for this title due to the matrilineal aspect of the Ashanti culture and that her elder brother Nana Akwasi Afrane Okpase, who was a powerful ruler at the time, appointed her to the role. As the Queen Mother, Asantewaa held many responsibilities, including being the Gatekeeper of the Golden Stool. The Golden Stool is an emblem of the Ashanti kingdom, cultural system, and power. Since the Queen Mother is elected to be the mother of the reigning king, she present candidates for when the occupant of the Stool (the chiefdom) becomes vacant, in turn protecting the establishment of authority. Additionally, since the Queen Mother is the main adviser for the King, and thus is the second highest position within the empire, she fulfills the role of guarding the Golden Stool. In 1896, the Ashanti peoples began to rebel against the British presence in their lands and the British attempt to construct the “Gold Coast” colony. To retaliate, the British captured and exiled Asantehene Prempeh I, King of the Ashanti, and Asantewaa’s grandson Kofi Tene, who was also a powerful leader. The British removed the king and other Ashanti leaders to the Seychelles Islands in an effort to acquire the Golden Stool. While remaining leaders within the community debated on how to best respond to the British threat, Asantewaa held her ground and rallied the troops. Her leadership and passion led to her role as Commander in Chief of the Ashanti army. In turn, the Anglo-Ashanti wars’ fifth and final war against the British became known as the Yaa Asantewaa War of Independence (or the War of the Golden Stool), which began on March 28, 1900. That conflict began when British representative Sr. Frederick Mitchell Hodgson sat on the Golden Stool. Since the Stool was not a throne, when Hodgson’s act became known, Yaa Asantewaa led the rebellion which resulted in the death of 1,000 British and allied African soldiers and 2,000 Ashanti. Both totals were higher that the deaths from all previous wars between the Ashanti and the British combined. To inspire the leaders of her community, Asantewaa proclaimed that if the men of the kingdom would not defend the people, then the women would rise to the challenge. This both invigorated the men and challenged traditional gender roles. She led the rebellion and became an image of strength and resistance. Unfortunately, she was captured during the rebellion and exiled to Seychelles, where she died in 1921. Yaa Asantewaa remains a powerful reminder due to her impactful actions in both empowering her people and in tactics against the British army. In August 2000, to commemorate her influence, a museum was opened in her honor in the Ejisu-Juaben District of Ghana. Similarly, there is an achievement award titled the “Nana Yaa Asantewaa Awards” (NYA) which honors women who uphold the values and leadership of Asantewaa. “The Queen-Mother” http://www.thekingdomofasante.com/the-queen-mother/; “Queen Mother Nana Yaa Asantewaa of West Africa’s Ashanti Empire” http://www.blackhistoryheroes.com/2010/05/queen-mother-nana-yaa-asantewaa.html; Chantal Korsah, “Queen Mother of the Ashanti Confederacy” http://dangerouswomenproject.org/2016/07/22/yaa-asantewaa/; “Yaa Asantewaa (Queen Mother of Ejisu)” https://www.ghanaweb.com/GhanaHomePage/people/person.php?ID=175; Danuta Bois, “Yaa Asantewaa” http://www.distinguishedwomen.com/biographies/yaa-asantewaa.html; “Queen Mother, Yaa Asantewaa 1840 – 1921” http://nanayaaasantewaa.de/who-is-nana-yaa-asantewaa/.